Established in 1991, our mission is to promote the healthy development of the study abroad industry in Japan by establishing ethical best practice guidelines for organizations, educating and training study abroad counselors and advisors, and engaging in various other promotional activities to increase awareness of, and further the development of a safe and rewarding environment for Japanese study abroad students. Recognized by the Japanese government as a General Incorporated Association in 2008, JAOS membership consists not only of private companies but also includes public organizations such as the Australian Embassy Marketing Office and the British Council, as well as various trade-related associations. As of 2014, total membership now exceeds 60 organizations. JAOS is also an active member of the international association FELCA (The Federation of Education and Language Consultant Associations). By representing Japan through this membership, JAOS is able to educate and promote Japanese market needs to industry providers and assist them in developing the optimal study abroad environment for Japanese study abroad students. 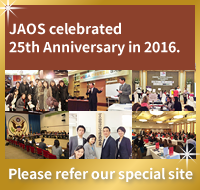 Established and administered “JAOS Study Abroad Scholarship for Outbound High School Students” based on funding by MEXT in 2009. Produce and manage Study Abroad website to provide accurate information for study abroad candidates. Conduct researches on study-abroad related issues and trend and to communicate the research findings to the global study-abroad community. As study-abroad promotion industry shapers and opinion leaders JAOS shares Japanese study abroad trend with foreign educational institutions and industry groups. To spread and communicate the study-abroad related trends and news to mass media in Japan. JAOS conducts on regular basis meetings with Foreign Government Educational Representatives (FGER) to exchange information, views and future ideas, working closely with officials from various embassies and public organizations. ● Collaborate with J-CROSS to mutually assist respective missions. Japan Commission for the Regulation of Overseas Study Services (J-CROSS) was established by JAOS, The Council of International Education & Language Travel, Japan (CIEL) and Ryugaku Kyokai (Study Abroad Support Council, a consumer protection organization). This non-profit organization provides a new system of businesses certification for study-abroad industry in Japan. Certification process includes certified copies of registration, financial statements from the past 3 years, and a contract agreement. JAOS established a study abroad counselor training program and certification system in order to advance and standardize the quality of the profession. This certification is not only for study-abroad agents but also for those who work and desire to work in the field of international exchanges in various areas such as universities and other educational institutes. JACSAC (Japan Association of Certified Study Abroad Counselors) was established within JAOS to establish, maintain and enhance the quality of study abroad counselors. JAOS Certified Study Abroad Counselor becomes an official member of JACSAC.